Promoting content is such an important part of competing for space online. Internet real estate is secured by those (big or small) that can market their content most effectively. Ok, that makes sense but how do you do it? There are many variables. But there are many businesses that have very different products services and most relevant, different competition. Before we plow into all these variables and details a content marketer should know, I want to make you aware of a video that I created to do the same thing but using a shorter and easier method. To get your own copy of this video, just click the "CTA" below. Oh yeah, a CTA or call to action is one of these marketing components we will discuss. Now we can get into some of these variables in more detail. Before we do, it's important to remind you of what you're trying to do from a higher level. You have created a valuable piece of content that was developed using your expertise. This content could and should help a lot of people and/or businesses. In order for those thoughts to reach fruition, you must get this content in the path of your target audience. This is important because you DON'T need to get your content in front of "everybody". 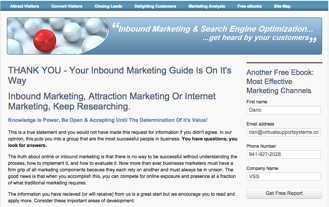 Maybe you feel that would be better but it's not a reasonable goal in the world of inbound marketing. You goal is to recognize and isolate the market or markets that would most benefit from your content. Then apply the strategies we talk about below to better compete for that audience and the attention of that audience. Once this is accomplished, your goal will be to convert as much of this audience from purely visitors into contacts. I will get into this in detail in another blog post but also try to recognize that your entire audience can be broken into 3 categories. Your goal will be to make it as easy as possible for this audience to filter into the category that fits them best and will keep them connected, for as long as appropriate. I am referring to the traditional sales funnel your business experiences from initial contact all the way to customer. Again, stay tuned to this blog so we can cover these categories in more detail. They are that important. Let's first be clear on what we're talking about. What content? Where is this content coming from? Don't I already have content? Who creates my content? An eBook: This is a great piece of content. Normally significant in length and detail, covering one primary subject. A White Paper: This is becoming an increasingly popular term and configuration of content. This is also created to educate and is similar in look and feel to an eBook but most likely shorter. Video: Sure, video is content. It's just in a different format and layout than you might have originally thought. The purpose of video content is the same as the 2 items above. Like the video I am offering you right here, it can be created using any theme, any length but probably has more entertainment value (than a blog post or eBook) along with the educational element. Blog Post: Like this blog post, you can create your content in the form of a new blog post. Create a post that is as entertaining as possible but with a main purpose of teaching the reader about something they are researching. There are many other forms of content and you should do the appropriate research to make sure you're familiar with all of your choices. The last thing I want to explain about content is that it needs to be created with a certain amount of frequency. Generally, the more competition you have (especially for a targeted keyword), the more frequently you should be created and posting new content. Never forget that the major search engines put a lot of value on a website that creates content on a frequent basis. The opposite would be a website that is dormant. That's a no-no. Once you have your new eBook, white paper, video or web page complete and ready to hand over to your target audience, you'll need a landing page. Technically, a landing page is any web page that includes a "form". I will take this definition a step further and describe it as a page used to connect with your audience. You will not want to simply post your new content on a web page for all to see immediately. After all, your content has value. Maybe you won't want to charge dollars to see your content but you will want a commitment in the form of them providing a name and email address. This is the "opt-in" contact that is your initial objective. For example, I am giving you a free video that explains everything I'm talking about here but in a much more entertaining delivery method. In exchange for that, I am asking for your name and email address so I can notify you in the future when I have new information on this subject. You, like your audience, can "opt-out" at any time. The landing page is also the tool you will use that determines which level of the funnel your target audience actually belongs to. For example, the video I provide here is targeted to people in the research phase of the sales cycle or "Top Of The Funnel" individuals. On the flip side, think of a "free consultation" landing page and form. This is focused on the "Bottom Of The Funnel" audience or those people who are closer to making a decision. The CTA or call to action is a very important part of the content marketing puzzle. 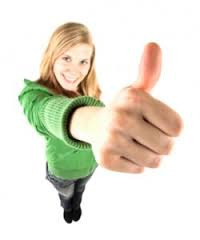 It is where you encourage your audience to take the appropriate next step. The CTA can be an image like I used above in the opening or just a line of text that is linked to another page. Without an effective CTA, the process can come to a screeching stop. I can't tell you how many web pages, blogs, social media posts and even landing pages that were missing a call to action. The statistics alone will convince you of the difference in campaigns when using or neglecting to use the proper call to action. Just as I am doing here, you can also develop a new blog post to help promote your new piece of content. I have a new video that I think will be very helpful to those researching the subject of content marketing. So, why shouldn't I write about this topic for both the benefit of the people researching content marketing AND the primary search engines like Google and Yahoo that are evaluating my own website for ranking position. Because search engines do evaluate every website to determine search engine position, a new blog post will help them realize your website is not dormant. To continue this process, think about what happens at every stage. You have your great content, you have your landing page and blog post. After a potential contact completes the form on your landing page and hits that "submit" button, what happens next? Typically, you want them to be directed to a Thank You Page. You guessed it, this is where you have a chance to do 2 things. First thank them for the request and second, supply them with a new offer. Now I don't mean a new offer as in sell them something, I mean simply provide some additional information like providing a different piece of content. The thank you page is used to both continue the entire content marketing process and to open the door for additional opportunity. Email marketing comes in many shapes and sizes. I don't have to tell you because you probably experience this every day. The Broadcast: This is simply sending email to your entire database in an effort to inform them that you have this new piece of content ready and available to them. The Drip Email Strategy: These emails are harder to see, especially if they are done well. The idea here is to establish what we in the inbound marketing business call a workflow. These emails are very specific, personalized and sent after a specific trigger. The trigger can be a specified period of time or a reaction to a completed form. There are certainly other elements available to bolster the content marketing process and I will be writing about those as well in upcoming blog posts. However, the final component I am covering today is known as optimization. Normally when you see this term it's referring to search engine optimization, also known as SEO. In this case, I don't want to limit the understanding of this term to search engines only. When you successfully optimize ALL of the elements we covered in this post, you increase the chances for increasing visibility. You also increase the chances of people sharing that particular piece of the content marketing puzzle. So yes, you want to optimize the blog post, the landing page, the email, the content itself and any other resource you plan to use in this effort. REMEMBER: Bookmark this page (or just subscribe using the single field form on the top right), download the free video I created for you to learn how these components connect and use the following materials to learn more or use as an example of content. If you watch another video we posted focusing on the popular DIY approach to online marketing, you may start to feel overwhelmed. After continuing your research and making some determinations on the strategies that will best work for you, know that bringing in your own, highly trained and certified marketing team should be on the table for consideration. I know how surprised you might be when you learn the costs and the benefits of attacking this challenge using this partnership strategy. Whatever direction you decide to go next, always feel welcomed to reconnect, ask for a no cost conversation or just ask a single question. That's what we do here. We are a "certified", online marketing agency that brings small business the marketing components they need to address the weaknesses and utilize the strengths that represent their current, marketing condition. Should you care to share you own experiences or offer any input that will help others, please use the comment section below. You never know what kind of contacts you'll make and you may help someone take the next step towards success. As I normally state in these Inbound Marketing blog posts, the information below was created for businesses & professionals looking for inbound marketing strategies. Inbound marketing professionals should already be familiar with this information but I do encourage marketing professionals to share this blog post with their readers. 2. Organic or natural results. Sponsored Results: Paid search engine results (sponsored results) are those listings that require a fee for the search engines to list their link for specific, selected keywords or keyphrases. The most widely used form of paid listing is Pay Per Click (PPC). This is where you pay each time someone clicks on the link in your advertisement on the search engine results page (SERP). The price increases with the level of competition of the selected keyword. Ranking in the organic search results is better because not only is it FREE, but research shows that people click on the organic results 75% to 84% of the time and paid results only garnish 16% to 25% of the attention. Part of the reason for this is that consumers are intelligent enough to understand that money alone can get a web site to the top of a page through these sponsored ad purchases but organic results are dictated by the direct relevance as determined by Google or the other major search engines. This gives organic search results and those web sites that achieve these results much more credibility. How Do The Major Search Engines Decide Page 1 Rankings? • Search Volume – Given two different keyword phrases, optimize for the one with the larger number of searches. • Relevance – Choose keywords that your target market is using to describe and search for your products and services. • Difficulty or Competition – Consider your chances for ranking on the first page of Google for that keyword phrase. Look at the sites ranked in those first 10 slots, their authority and relevance to search terms, and gage if you will be able to overtake them to secure a spot on that first page. • Place keywords in the page title, URL, headings, and page text. • Optimize your page description for maximum click-through-rate when your site ranks in Google searches. • Place keywords in other “invisible” places on your web site, including meta-keyword tags and alt-text on images. • Build more inbound links from other sites into yours. Each link serves as a recommendation or a reference. • Build more links within context, i.e. those with valuable keywords in the link anchor text (the text that is hyperlinked to your site). Link anchor text provides context for the search engines to understand what your site is about. • Build more links from trusted websites. Just as references from well-respected friends and experts offer more value, so do links from trusted and well- respected websites. • Track number of inbound links, keyword rank over time and compared to competition. • Measure real business results: number of visitors, leads, and customers from SEO. Below is an example of search engine ranking results produced for my company. 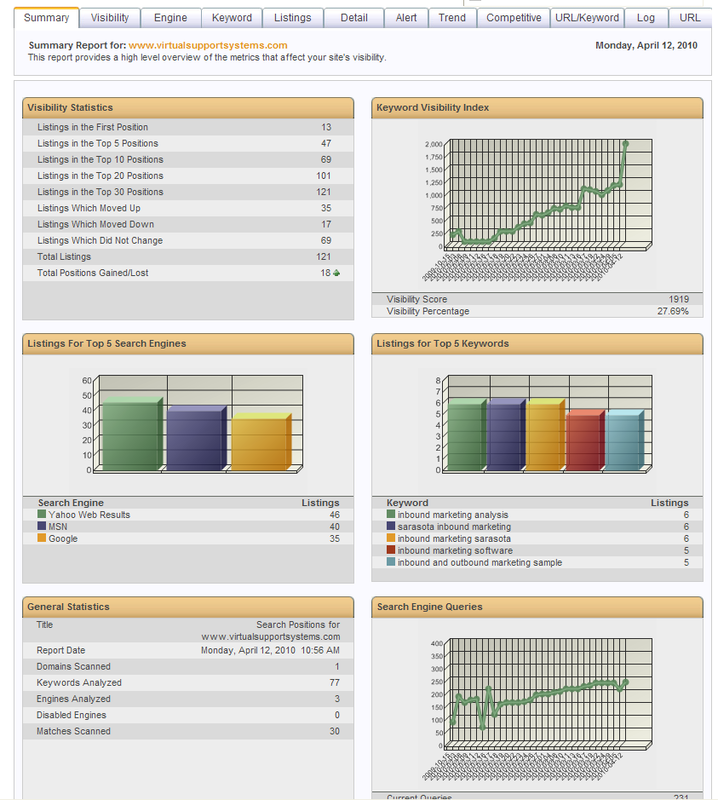 This is some of the data I use to help understand my inbound marketing productivity. The best search marketing must be complete search marketing. To be clear, as a search marketing professional, my experience tells me that the more complete a search marketing strategy and plan is, the more effective it will be. Maybe that is nothing more than common sense to some but others don't seem to be clear about the various elements that are available when creating a comprehensive search marketing project. Use the search marketing checklist below as a basic road map for your search marketing project. The more of these components you have included in your plan, the better. Remember though, don't just include them, pay them attention and develop them consistently. Compelling content: Make sure you offer the visitor what they were searching for in the first place. This helps your efforts from both the visitor and the search engine's perspective. Blog: This is critical for developing your timely content, attracting links and increasing the total number of pages on your web site. # of Indexed Pages: Pay attention to the number of your web site's pages that are indexed by Google. The more, the better. Readability Level: Make sure your writing and the content is developed for your target market and not too difficult to understand or too elementary. Meta Tags: Make sure all the HTML tags on each of your web pages have been optimized for the relevant keywords or keyphrases. These include title tags, description tags, header tags, image tags and keyword tags at a minimum. Domain name renewal term: Make sure your domain name is renewed for more than 2 years into the future. The search engine see this as a component of stability. Domain name redirect: Make sure you have a permanent redirect for the http://domainname.com portion of your sita as search engine may see this and the www.domainname.com as two separate web sites. Inbound links: The more links from other web site's that point to your web site the better. One way links are your goal as reciprocal links don't carry weight anymore. You also want links from related web site's with good traffic. Linked In account: Especially if your products or services are business to business related, this is a good social media web site to connect and promote. Landing pages: Be sure to have your web site configured to provide targeted information to targeted markets and keywords. Conversion forms: Make sure you have conversion forms in place to convert traffic to leads. Comprehensive search marketing software: Manage all of these and other elements of your search marketing plan with a complete software application. These elements have much more detail than what I have listed in this best search marketing checklist. My recommendation is to use the advice of a search marketing professional coupled with search marketing software. There are other components of a comprehensive search marketing strategy but this best search marketing checklist is a great place to start the analysis of your project.